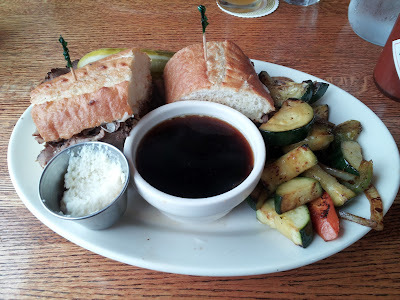 French Dip Reviews: 4 of 5 DeliciScore™ (Great) Awarded to Ramblin Jacks for their French Dip Sandwich in Olympia, WA on this 15th day of April, 2012 - I miss you, Harbor Wholesale Foods! 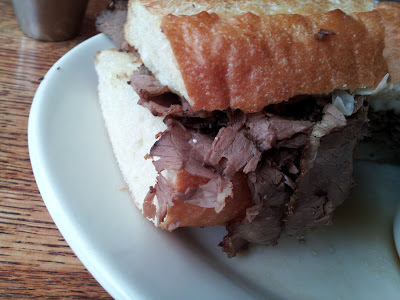 4 of 5 DeliciScore™ (Great) Awarded to Ramblin Jacks for their French Dip Sandwich in Olympia, WA on this 15th day of April, 2012 - I miss you, Harbor Wholesale Foods! Really rainy day in Olympia with my coworker and friend, Liz. Here it is: "THE FRENCH DIP. 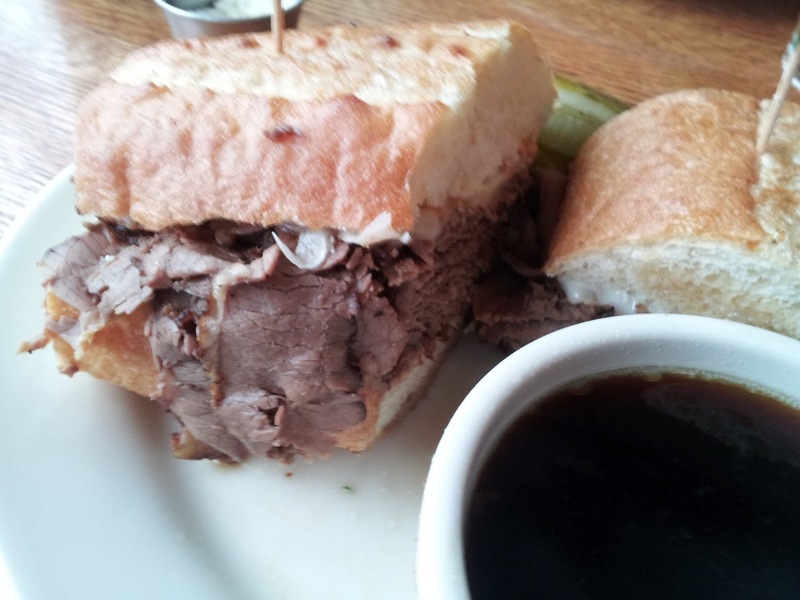 Alder smoked beef and jack cheese served on a french roll with hales cream stout au jus." the overall size of the dip was pretty generous. It was served with a nice Kosher pickle. The jus was plentiful. Here's a view of the bread and beef. The beef is well done, probably not very juicy. 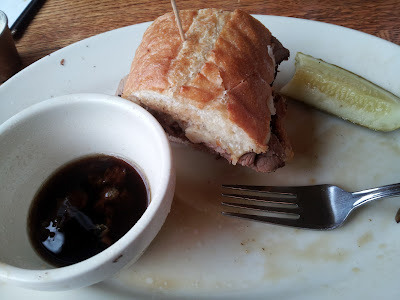 The bread is about right for a French dip although may have been overly absorbent. Here's another view of the beef. From here it looks a bit dry. A close-up of the jus (note the oil separated) and grilled vegetables: zucchinis, carrots, onions, peppers. 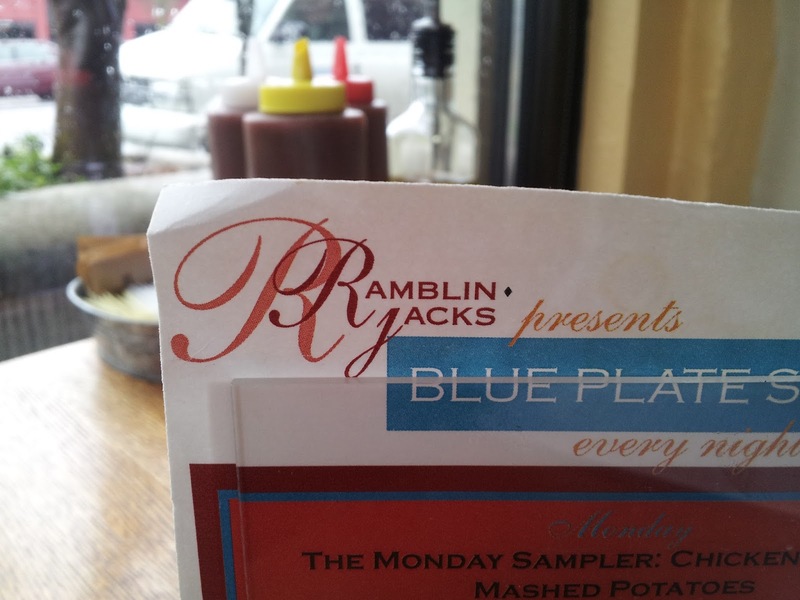 to come by and I've never met a wait person (to this point) that is stingy or slow with supplemental jus. Overall this is a pretty good dip. I give it a 4 on the scale of 0 to 5. The waitress here was really great and she even tried to sell us on dessert (at lunch) really early on. I took the second half to go. I didn't really notice the jack cheese. The bread was a 3 of 5. 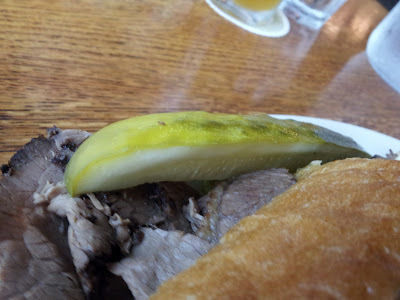 The jus, probably a 4+ of 5, and the meat was about a 4 of 5 although a bit dry. 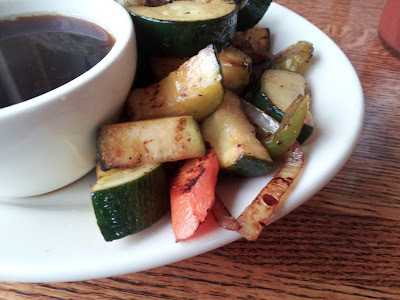 The pickle was good and it was nice to get grilled veggies on the side and real horseradish.